I have made it as far as Tokyo as part of my rapid tour of Japanese dinosaur collections and have spent the last two days at the excellent National Museum of Nature and Science. Sadly once more there is no time for a detailed post about the collections or the museum itself (yet: they will arrive eventually) but I can at least dash off these quick, (if somewhat unexciting) picture based posts. Having just come from the Fukui Prefectural Dinosaur Museum, it therefore seemed appropriate to use Fukuiraptor to show off at least a small part of their collections there. This is a reconstruction on display in the main hall, though there is quite a bit of material now from various specimens such that this is likely to be generally very accurate (though there is little skull material known, so potentially at least that could be quite different). More will follow, thouh obviously I’m *really* busy right now. The great Darren Naish of Tetrapod Zoology has a post up on rhynchosaurs for those who are interested. However I am well aware of the fact that I am getting far more traffic from him than he will from me, so this post is also a thoroughly self-serving attempt to keep new reader on here a bit longer by linking to my own rhynchosaur posts. Darren’s post comes off the back of my own description of a new rhynchosaur from the UK last year that I completed with Mike Benton, the not especially famous Fodonyx. Rhynchosaurs have also cropped up on the Musings before with a life reconstruction of Scaphonyx in Beijing, and Darren himself appeared with the original Fodonyx skull way back at the dawn of the Musings. Well OK, not exactly, but it is winter and the Fukui dinosaur museum is next to a ski resort, so it is perhaps no surprise that a few of their dinosaur models that sit in the grounds of the museum have more than a light dusting of snow. I have spent a very enjoyable two days exploring both the galleries and store rooms of this museum and will in course (as promised) provide a proper review and some photos. Time is however at a premium when you ar eon the road like this, so again, just a short post I hope you enjoy. Now this is worth reading. Inevitably (and both understandably and quite correctly) there is a deluge of Darwin and Origin related stuff heading our way this year, and I do fear that the good will likely be swamped by the mediocre in the media as everyone jumps on the bandwagon desperate to have a say, make a sale, join in and not be seen to be missing out. However, there will of course always be room for important, intelligent, informed, interesting and articulate people to use the opportunity when it comes to say interesting, intelligent, informed and important things in an articualte way. David Attenborough is one of those people and in The Times, he speaks out (something of a rarity in itself) on his work as a presenter and Darwin’s legacy as well as evolution and creation. Go and read the words of one of the UK’s best loved personalities and someone who has both the standing and respect to make a difference, and I’m delighted to see him doing so. I’m on the road in Japan having just made it to Katsuyama, home of the famous Fukui Prefectural Dinosaur Museum. That I’ll get to see tomorrow and in due course posts will follow, but in the mean time you will have to be satisfied by this very quick post. 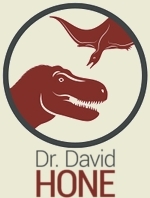 The title is hardly spectacular – I’m not sure anyone with even a passing knowledge and interest in dinosaurs is not aware of the fact that the giant tyrannosaurs like Tyrannosaurus had proportionally small arms. However, this photo is a really good illustration of just how small some of them were. The humerus (upper arm bone) in question is a genuine one of a Tarbosaurus (basically the asian Tyrannosaurus and very simiular in size and shape) that I found in the collections in Okayama a few days ago. As you can see, it is essentially the same size as my own upper arm, yet I am notably not an 8 metre and 6 ton theropod dinosaur (it’s from a sub-adult animal, and admittedly an adult would have been quite a bit bigger, but you get the general idea). In short, tyrannosaurs really do have small arms. Well the Musings has been excpetionally quiet here of late thanks to my illness. I am much improved, but in less than 12 hours I’ll be in the air on my way to Japan for a research trip. I am not sure how much blogging I will be able to do, but hopefully a few pictures at least will make it on here. Please do spread the word on the Zitteliana volume and the Musings will resume more or less normal service in about 2 weeks. See you then! I have been bedridden the last couple of days hence the lack of new posts. I also seem to have managed to lose my USB drive with the posts on it, and while I do back up, there’s probably a weeks work gone from the Musings unfortunately. I’ll be back up to speed in a few days I hope. With the pterosaur postrs flying thick and fast on here, it seemed appropriate to pick a pterosaur based AABQOTW. This time out then it is that ongoing issue of just what was the orientation of the pteroid? As ever, you can see the debate here. In our final post in this series my own PhD student Ross Elgin takes us through the work we did (with others I must hastily add) on the aerodynamics of pterosaur crests. This is one of those much discussed but little researched areas with (perhaps ironically) lots of hot air, but little moving air (like in a wind tunnel for example). So read on as we take to the skies with those crested pterosaurs. Today on the Musings we welcome Paul Barrett to talk about the distributions of pterosaurs in time and space – just when and where are all (yes, *all*) the world’s the pterosaur fossils from? This kind of huge data gathering paper is of immense value to research and this will, I have no doubt, result in masses of new research and renewed interest of pterosaurs (assuming the interest has not already been renewed enough already).